Welcome to our Faith and Work page. 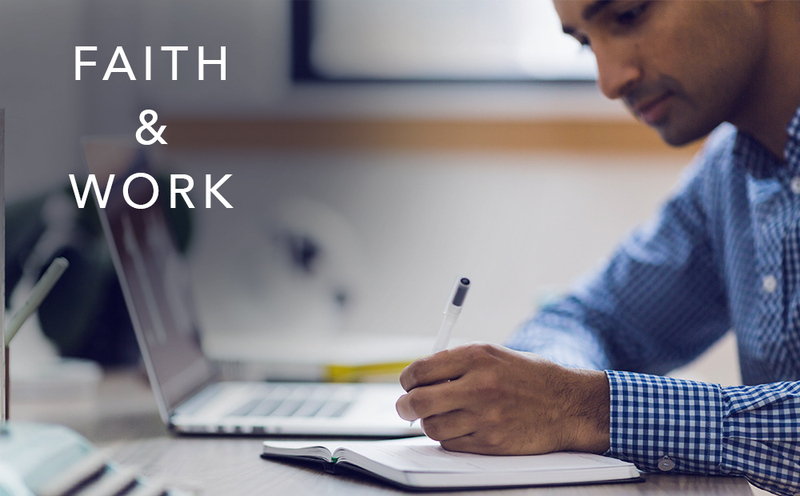 Here, you’ll find links to our Faith and Work podcasts and blog posts as well as an expanding, annotated bibliography of recommended sources on faith, work and economics. Keller, Timothy. Every Good Endeavor: Connecting Your Work to God’s Work. New York: Dutton Adult, 2012. This work presents a biblical theology of work, focusing on a biblical perspective of stewardship and flourishing. It answers key questions related to our desire to work, the difficulties and frustrations of work, and finding satisfaction in our work. The authors also discuss the dignity of partnering with God in creating culture and serving people through every good work, encouraging the reader with the impact of Christian theism on the created order and the lasting value of human work. The book includes an epilogue which demonstrates how a theology of work has impacted the ministry of Redeemer Church. Nelson, Tom. Work Matters: Connecting Sunday Worship to Monday Work. Wheaton, Ill.: Crossway, 2011. Nelson guides the reader in rethinking work through a biblical worldview, focusing on the Scripture’s treatment of work and examining how God shapes people’s lives in and through the workplace. In this book, readers learn not only from the lives of biblical characters, but 21st century Christians working in a variety of contexts—from higher education and business, to medicine and the home—who demonstrate the difference a biblical view of work makes in one’s life and vocation. Reflection questions and prayers are included at the end of each chapter. Self, Charlie. Flourishing Churches and Communities: A Pentecostal Primer On Faith, Work, and Economics for Spirit-Empowered Discipleship. Biblical Faith, Work, and Economics Series. Grand Rapids, Michigan: Christian, 2012. In his book, Charlie Self specifically challenges Pentecostal believers, calling them to a level of discipleship that integrates faith, work, and economics so that believers view their work in light of God’s design for flourishing their communities. The first half of the book develops five principles of integrating faith and work through Scripture. Self’s greater and more unique contribution is the latter portion of the book where he develops how this integration is expressed both individually and through the local church. He specifically challenges the local church to engage all realms of society, including business, education, social justice, medicine, the environment, and the arts. Bolt, John. Economic Shalom: A Reformed Primer on Faith, Work, and Human Flourishing. Grand Rapids: Christian’s Library Press, 2013. Bolt sets out to present a biblically integrated view of economics and human flourishing from his distinct theological tradition. For him, the question is less about finding the biblical economic system, but rather understanding what elements within an economic system are consistent with biblical teaching. On this premise, Bolt argues free-market capitalism is the most biblically consistent economic system in a world that is constrained by the problem of sin. Wright, David. How God Makes the World a Better Place: A Wesleyan Primer On Faith, Work, and Economic Transformation. Grand Rapids: Christian’s Library Press, 2012. Writing from the perspective of the Wesleyan tradition, Wright sets out to aid the reader in discovering the potential of work as a ‘lifelong source of well-being and fulfillment,’ not just for himself or herself, but for those around them as well. Drawing on the principles of Charles and James Wesley, Wright’ explains how principles of Christian discipleship should inform ideas about work, economy, and society. Steve Corbett and Brian Fikkert. When Helping Hurts: How to Alleviate Poverty Without Hurting the Poor … and Yourself. Chicago: Moody Publishers, 2012. Sherman, Amy. Kingdom Calling: Vocational Stewardship for the Common Good. Downers Grove, Ill.: InterVarsity Press, 2011. Sherman’s work helps pastors, ministry leaders and every believer integrate the concepts of faith and work while advancing kingdom purposes through their vocations, including a true stories of vocational stewardship in action. Focusing primarily on professional, entrepreneurial, and creative occupations, she challenges churches to deploy individuals as missional agents in their workplaces, blessing anyone within one’s sphere of influence with one’s God-given gifts. Kenman Wong and Scott Rae. Business for the Common Good: A Christian Vision for the Marketplace. Downers Grove, Ill.: IVP Academic, 2011. Wong and Rae present a Christian perspective on work, focusing on the concept of business as a transformational service for the common good. Incorporating a variety of real-world stories, the authors explain how Christian values can inform functional areas of business such as management, marketing and environmental sustainability. They also suggest areas where business should be affirmed as well as reformed, including practical ways to engage the corporate culture and live out biblical values in the business world. Austin Hill and Scott Rae, The Virtues of Capitalism; A Moral Case for Free Markets. Chicago, Northfield Publishing, 2010. In this book, Hill and Rae examine capitalism from a Christian perspective, arguing that it is the economic system most compatible with classic Judeo-Christian virtues. They demonstrate that economics is intertwined with moral issues by comparing capitalism to other economic systems, focusing on the impact these systems have on human rights and poverty. The book explains misconceptions of capitalism and addresses its challenges and critiques using key economic events of the early 21st century. Austin Hill and Scott Rae. The Virtues of Capitalism; A Moral Case for Free Markets. Chicago: Northfield Publishing, 2010. Gould, Paul M. The Outrageous Idea of the Missional Professor.. Eugene, Oregon: Wipf & Stock Publishers, 2014. Gould shares the idea that God wants to use Christian professors as professors to reach colleagues, administrators and students in colleges and universities, transform society and meet the world’s needs. He demonstrates that God’s mission to redeem and restore a fallen world includes disciples who teach in the most influential institutions in society. As many believers struggle to live missionally in their academic professions, Gould challenges his readers with a clear vision and practical examples through the stories of contemporary role models. Although his primary audience is Christian professors on secular campuses, those teaching on Christian campuses will find this book helpful in their broader interactions with the academy. This is a list of select resources provided by Hendricks Center staff and conference presenters. This list does not represent an official recommendation on behalf of DTS. Rather, it serves to highlight the reality of the specific issues and seeks to provide possible ministries with which area churches might partner. DTS encourages all attendees to thoroughly read and evaluate any resources that may be passed on in a training or counseling capacity.